Filling out a log sheet incorrectly can result in a fine. 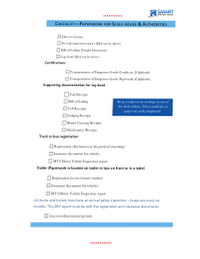 Learn how to fill out your log sheet correctly here. The United States log book and how to fill out the information that goes around the American logbook. 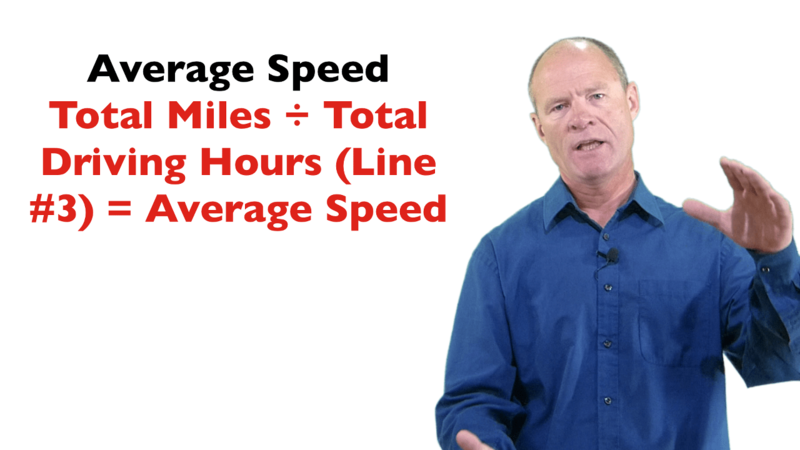 A couple of things you need to keep in mind: average speeds. If you get pulled into the weigh scale, you get pulled over by authorities, they're going to determine your average speed and potentially you could get a speeding ticket. You don't want to get a speeding ticket; you don't want to get a violation because if you do, unfortunately you're going to end up working the day for free. You don't want to work the day for free. So, we're going to show you how to correctly fill out the log book. We'll be right back with that information. The first thing that you can see here on the log sheet is the date. The date is fairly self-explanatory: month, day, year. As well, on this log sheet, there's a beginning and an end date. If you have several days off duty, you can put them all on one log sheet. So if you're off from the 14th to 21st of September, put 14 September 2016, in the top one, and then 21st September 2016 in the bottom one. As well, put a line all the way across Line #1, off-duty and write in big letters on the graph: 'OFF DUTY'. That way, authorities—if they look at your log sheet—will know that you had been off duty for several days consecutively. The next thing on the log sheet is the address of your home terminal. You can see the address here in the space for the address. There's two reasons that you need to put the address of your home terminal. First it's to determine if you do need a log book. They can figure out the address of your home terminal and determine if you are running farther than a hundred miles radius from that home terminal, and that you do in fact need a log book. If you are running less than a hundred miles, you don't need a log book, but the company is required to keep time sheets to determine the hours that you are running. Second, the address of your home terminal also determines the time zone that you're working. If you're working as a long haul truck driver out of California, and you run to New York, you're going cross three time zones. You need to keep your logbook according to the time zone in California where your home terminal is. So the home address also determines the time zone in which you working and authorities can then figure that out on your log sheet. So the time zone - always work in the time zone your home terminal. Employee number - some companies will have an employee number - other companies most of the time it'll just be the unit number for your truck or bus. Driver's name - your first name and your last name on the log sheet - print. Your co-drivers name. Also if you have a co-driver. If you're running team, you need to put that on as well. Along the right side of the log sheet you can see a recap for your work cycle: sixty hours in 7 days, or 70 hours in eight days and you can keep track of that there. As well, there's another video that I have created about calculating your work cycle, and I'll put a card up here for you to show you the video on how to determine your work cycle. Just one point that I will make about your work cycle, is that it is a rolling work cycle. So if you're working 70 hours in 8 days for example, the hours that you work nine days ago cross off and those are added to the bottom of your work cycle. So it's a continuous rolling work cycle. In order to reset that work cycle you need to take thirty four hours off duty and in that 34 hours off duty you have to have two 1-5 a.m. periods off duty. So essentially what they're trying to do— the authorities are trying to get you to do—is to take two nights rest to reset your work cycle before you go back to work. And again there's another video for resetting your work cycle. CLICK HERE: for video to reset work cycle. Pro number and shipping numbers - these are the manifest numbers. The manifest is... or the bills of lading are the contract between the people who own the freight who hired the trucking company to move the freight. 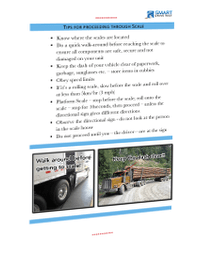 And you need to sign it saying that you took responsibility for the freight that went on your vehicle, whether your a bus, your truck, and then you delivered it to the address where you need to deliver it to - the receiver. They sign your bill saying that they in fact received it. You hand your bills of lading into your company and they're allowed to bill for the costs of transporting that freight. Consequently the company gets paid and you get paid. So make sure you put on the bills of lading number, because it's also a backup just in case the bills of lading go missing. For the bills of lading— the pro bills—there's inward and outbound so if you go out take a load out you bring a load back, there's going to be two bills of lading. A place here on the log sheet for the total miles that you drove for the day. This is important because the authorities will determine the average speed that you drove for the day. The average speed for the day will be determined by taking line #3, which is the total hours that you drove—driving time—taking the total miles that you drove and dividing the total miles by the total hours driven. Now on the flat—eastern United States & other places in the midwest—you can probably average between 50 and 56 miles per hour on the flat. If you're running in the mountains, it's probably going to be a lot lower— 43 to 48 miles per hour, depending on how heavy you are you running. If you have 80,000 pounds, you're going be running a lot slower than if you're running light with 20,000 or 30,000 pounds in the box. At the end of the day, when you finish filling out your log sheet, just have a quick look. Just take a calculator out, take the total miles divide it by line three—the number of driving hours—and make sure that you come up with the right average speed. Because potentially, if authorities pull you over, and when they look at that, you could potentially get a speeding ticket. The other space on the log book: tractor number, bus number, trailer numbers. All those need to be put in there to identify the unit which you're operating. If there isn't a unit number on the truck or bus, use the license plate number as the unit number. Most of the time, these trucks and buses - they all have unit numbers. As you can see on the log sheet, as well, there are two places for trailers. Semi truck drivers often pull more than one trailer in a day. If you come in, you drop the trailer in the yard and your other trailer is preloaded, they call it 'pin-to-pin'. You just pick up that trailer and then you write that trailer number in on your log sheet. Finally, driver signature: you have to sign the log sheet. The log sheet is in fact a legal document. If you were involved in a crash or some other incident that damages—public property, private property, or has an injury or fatality—there will be a post-crash investigation on the part of authorities, on the part of police. They will look at your log sheet and determine the hours that you were driving. So it is a legal document.- it has to be signed. 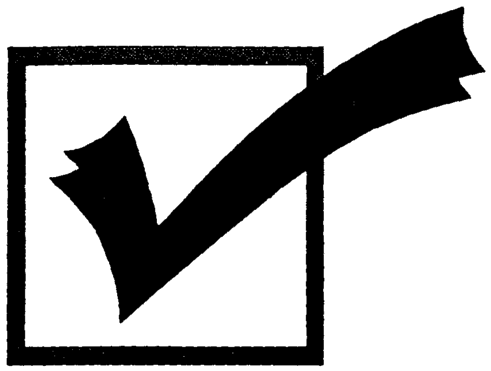 As well, in terms of signing your log sheet - it can also be used for the IRS (Internal Revenue Service) when you file your taxes at the end of the year. There's a per diem for truck drivers, if you're running long haul, or running beyond the hundred miles of your home terminal, you can claim that per diem, and your log sheets are the way that you prove that in fact you were away from home. So ensure you sign it; it's a legal document. Get your tax breaks because we all like to get paid and we want to get paid correctly. And as well, if you fill out the log sheet, you're not going to get a fine and end up working the day for free. Two important points that I just want to stress: 1) average speeds - make sure that you fill out the total miles and then take that total miles that you drove for the day by the number of driving hours. Divide the total driving miles by the total driving hours - make sure that you come up with the right average speed. 42 to 48 miles an hour if you're running heavy and in the mountains, or if you're running on the flat, you can probably run anywhere from 50 to 58 miles per hour as an average daily speed. Note as well, that for the total miles driven in a day, if you're running 11 hours as allowed by rules and regulations in the United States, your average daily mileage is going to be about 600 to 650 miles. You're probably not going to be able to run much more than that. As well, make sure you sign the log sheet because the log sheet is a legal document. If you're involved in a crash, there is going be an investigation. They're going to look at the hours of service and how many hours you're running and making sure that you're within legal requirements of hours of service regulations. And get paid correctly! The IRS will use your log sheets to determine that, in fact, you are eligible for tax breaks that are allowed and given to truck drivers. So make sure you sign your log sheet.